Ministry of Industry and Information Technology (MIIT) of the Chinese government, established in March 2008, is the state agency of the People's Republic of China responsible for regulation and development of the postal service, Internet, wireless, broadcasting, communications, production of electronic and information goods, software industry and the promotion of the national knowledge economy. The MIIT was also responsible for the nation's tobacco control, but this task will be assigned to a new health commission to be established as part of a broad governmental reshuffle. The Ministry of Industry and Information Technology is not responsible for the regulation of content for the media industry. This is administered by the State Administration of Radio, Film and Television. The responsibility for regulating the non-electronic communications industry in China falls on the General Administration of Press and Publication. The state council announced during the 2008 National People's Congress that the Ministry of Industry and Information Technology will supersede the Ministry of Information Industry. The new ministry will also include the former Commission of Science, Technology and Industry for National Defense, the State Council Informatization Office and the State Tobacco Monopoly Bureau. 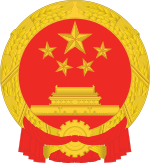 In 2013, the ministry's 'Made in China 2025' plan was approved by the State Council. It took over two years to complete by one hundred and fifty people. The plan's aim is to improve production efficiency and quality. ^ "China's ministry in charge of tobacco control had ties to the industry. Not anymore". South China Morning Post. Retrieved 2018-03-16. ^ "Made in China 202". Center for Strategic and International Studies. Retrieved 2015-07-14. This page was last edited on 9 April 2019, at 05:15 (UTC).